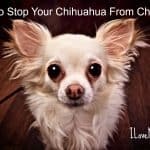 Chihuahuas are one of the most popular canine breeds around and no wonder. They are loyal, adorable and have loads of personality. Chihuahuas can be seen in many parts of the world being walked by their owners, or carried in tiny dog purses decked out in rhinestones. Chihuahua owners love to dress up their pooches in tiny clothes made specially for them, and celebrities can be seen toting them around Hollywood, even on the red carpet. 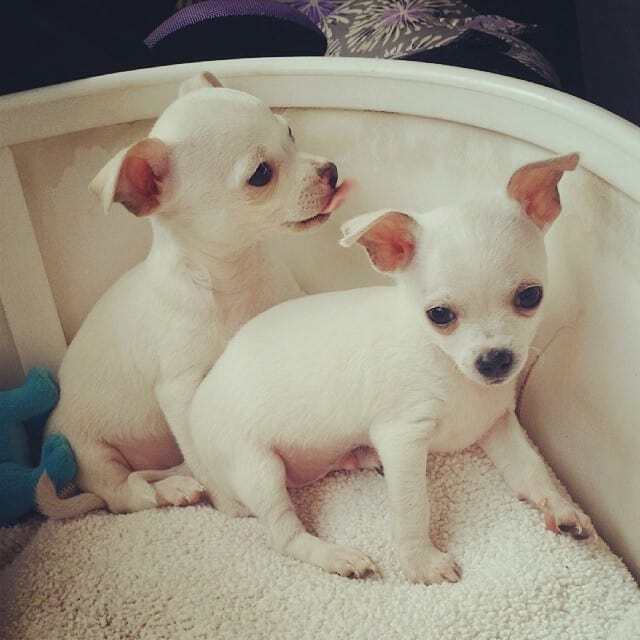 Chihuahuas are often called Chis for short. The Chihuahua breed originated in ancient Mexico and is considered one the oldest breeds of canine in Mexico. Most people believe Chis are descendants of the Techichi. Techichis were a canine breed of dogs that dated back to Mayan times and were described as being extremely tiny. The Mayans were conquered by the Toltecs, and the Toltecs are believed to be the first to domesticate the Techichi and bring the dogs into the home as pets. The Toltecs also used the Techichis for religious purposes, and some believed the dogs were sacred. Techichis have been depicted in Mayan, Aztec, and Toltec writings and drawings found in ancient tombs and pyramids. In 1850, Techichi dogs were found in the Mexican state of Chihuahua near old ruins built by Emperor Montezuma. When explorers came searching for the new world, it is believed that the Techichi bred with a canine specie brought over from the explorers, and that resulted in the Chihuahua we have today. The first Chihuahua was registered by the American Kennel Club in 1904 and was named Midget. Chihuahua popularity in the United States was slow during the early 1900’s. In the early 1900’s, most people lived on farms and wanted dogs that could serve a purpose. Folks opted for dogs that could herd livestock, chase off varmints, scare off predators, or be used in hunting. 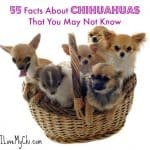 Because of their smallness, Chis were considered useless on the farm. 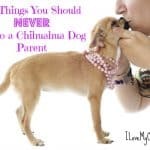 One of the myths going around back in the day, was that having a chihuahua sleep next to a person in their bed, would transfer their illness (usually asthma or other lung diseases) from the human to the dog. 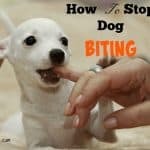 One of our readers told about how her uncle did this and it actually worked, but killed the poor chihuahua. Glad we don’t use chihuahuas in that way anymore! During the 1960’s, the population in cities started to boom, and many people were living in small apartments or houses. Because of this trend, people were now wanting a smaller dog that was suitable for household living and companionship. 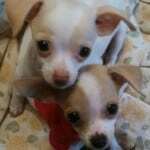 The smallness of the Chihuahua pertained well to city folks, so the popularity of the Chis was on the rise. Chihuahuas were first popular in the states that border Mexico, such as Arizona, Texas, and New Mexico. Eventually, the Chihuahua breed spread to other cities all over the United States, and even in other countries. Ever notice how Chihuahuas sort of resemble a fox? There is a reason for that. It has long been thought that Fennec foxes were bred with the early Chihuahua ancestors. The argument against it was that a dog and a fox cannot interbreed. Well that argument was put to rest in 1980 when a Chihuahua and a Fennec fox were successfully bred. Chihuahuas are known for their tininess, but have other neat characteristics as well. Chis have the longest lifespan of any other dog breed and can live well past the age of 20. Chis are also known for not backing down toward other dogs, no matter how big they are. Chihuahuas have over the top personalities and can become fussy. They have been referred as “spicy little tamales”. In 2013, Chihuahuas were listed as the 22nd most popular dog in America. But in my book, they are the most popular in my house (I may be biased). 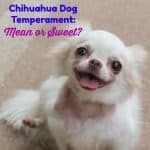 Chihuahua Dog Temperament: Mean or Sweet? My sweetie, ittybitty got her nails done. Aww, such pretty nails on a pretty little girl! Yes they are Lori. Thanks for visiting! Wow! My Booker is half child half dauchhound, but he could be ittybitty’s twin! He even has nails like hers! *as Booker looks at me insulted, snorting* well, unpainted, of course! *Booker looks at photo, sniffs screen, ears in up forward “Hey, what’s this?” Position. * great photo, really shows those beautiful eyes and caramel color…Thanks! I’m sure she is Blanca. They are such special little dogs! Loved the article but “spicy little tamales”? Really? Cecenca ahmo nictlazohtla in mocamalihtoh. That’s Nahuatl for I don’t like your joke. Not my joke Lucia, that’s just the research I found. I personally would never call them that. its a cute name for a cute bread. love my dogs. love the page. Glad you love the page Lala! He has an adorable face Wendy! This is our baby she is 2 yrs old little over three pounds. What an adorable little baby doll Ellen! What a cutie! Love her coloring and eyes. Such an amazing breed. I love them. Each one of them has their own different personality. Chis do love their blankies don’t they? I’m so glad you gave this sweet little guy a home Yvonne. I have a larger Chi (12 lb at 4 yrs old) named Rico. He has been a Godsend as a companion, and quite entertaining. Smartest dog I have known, and having had Springers and Labradors, that makes a statement, in my opinion. He will chase anything that is running away from him (-:), but will run away from anything chasing him (flight or fight) but I have seen him stand up to and interact with dogs 10 times his size. He is a self-appointed neighborhood watch dog, and chases the kids around (but not with nefarious intentions). He sounds like a great dog Robert! Yes, chis are known to have a Napoleon complex and not realize their size. They will often stand up to dogs much bigger than they are. I’m glad you rescued Max Jane! I love everything about this site. Thank you so much for all the work you do on it. Btw, I’ve been wanting to post my beautiful boys picture but have not been successful. Any information would be appreciated. I’m glad yo like it Karen.Where are you trying to post your photo? In the comments? If it’s not working, it could be because the photo is too large. Do you know how to make them smaller? If not email me the photo at cathy@ilovemychi.com and I’ll reduce the photo for you. Cathy, I think I see a bit of terrier in Lucas’ sweet face. In a small way he resembles my sweet rescue BO who is terrier mix. Take a look at BO’s face and see if you can see a tad of terrier. Lucy is so pretty, she is just beautiful! Yeah Bo does look like he has some Schnauzer and/or terrier in him. Both boys are cuties! When you said you couldn’t see the photos are you talking about the photos I had in the newsletter that was sent out this morning? If so just look to the top of that email and you should see where it says “Display Images Below”. It may say something alittle different depending on which email provider you use but I believe you use Gmail and that’s what it says there. Just click on that and all the images will show up. Yes, Cathy, the pics from today’s send will not come thru. I do have gmail but I do not see anything above that says click on to see images. This is the first time that has ever happened. Also, when I open the Newsletter I get a big warning sign that this email may not have been sent by Cathy so it advises me not to click on any of the links????? LOL!! I was afraid to open the newsletter but I find it by just typing in the I LOVE MY CHI NEWSLETTER NUMBER SUCH AND SUCH. I may have inadvertenly clicked on something I should not have and my computer is acting up. I do see the pic at the top of the page of those beautiful white chibabies and I see my post of BO and Pinto. My son, my tech support hahaha is in Dallas but when he comes home tomorrow I can ask him to see if he can fix it for me. If you are in any way of the storm, you are in my thoughts and prayers. I sat thru several bad hurricanes in Biloxi, MS and Camille did make a believer of me!! Stay safe!